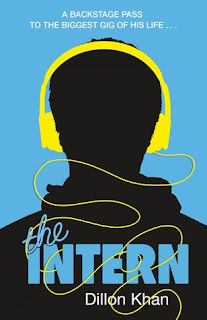 I'm currently reading The Intern By Dillon Khan, which I am loving. It just happens to take place back in 2000, when I was just turning 16 and so happily reminds me of times past. "When Jay Merchant lands an internship for the best job in music television, he is given a backstage pass to the biggest gig of his life. The velvet rope to the biggest VIP parties and hottest celebrities has been lifted and now he's got to capture it on camera. But with only six months to turn his intern dream into a real job, does he have what it takes? It's time to face the music..."
To Celebrate the release of the book, Puffin have created this incredible trailer - hope you enjoy!!! !